• This game will be decided by penalty kicks. 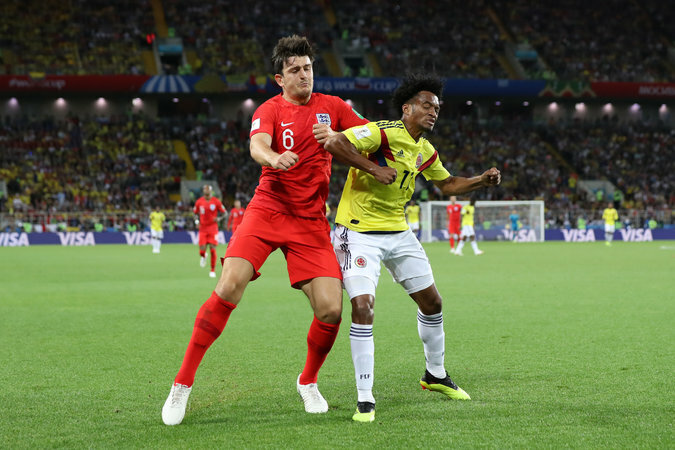 England and Colombia are tied, 1-1, after Colombia’s Yerry Mina scored in the waning minutes of this World Cup knockout game. • Refresh here for live World Cup updates and analysis from Moscow. England has been in three World Cup penalty shootouts, and lost them all. They went out in 1990, 1998 and 2006 on penalties. Colombia has never been in a World Cup penalty shoot out. Two round of 16 games this World Cup have previously gone to penalties. Russia defeated Spain, and Croatia defeated Denmark. One minute of added time before we go to penalties. It would be a good idea for a team to score right now! Sure, Juan Cuadrado gets a yellow for a pretty dangerous slide tackle. More importantly, he gives England a free kick, but David Ospina punches the subsequent cross out for a throw in. Colombia makes their last substitution, with Cristián Zapata coming in for Santiago Arias. Zapata is a fullback for AC Milan. Eric Dier gets free for a corner, but puts it over the bar. Dier collapses on the ground afterwards, knowing he should’ve done better. England have held the ball for a couple minutes here, with Vardy threatening to get a shot off a few times. Carlos Bacca can’t quite get his head to a Juan Cuadrado, but it wins Colombia a corner. As usual Yerry Mina rises highest, but he puts it out of play. We are going for 30 more minutes in Moscow, with the winner advancing to face Sweden in the quarterfinals. Jamie Vardy comes on for Raheem Sterling, and Luis Muriel for Juan Quintero. Colombia gets three crosses into the box in about a minute, but can’t a solid head on any of them. Andrew Das: An attacker for defensive-minded midfielder — is a message sub. But so is Colombia’s next one: forward Luis Muriel. He’s just stripped off his warmups. Colombia makes its second change, bringing Mateus Uribe in for Carlos Sánchez. Harry Kane wins England another free kick and is the target at the back post, but he is called for offside. 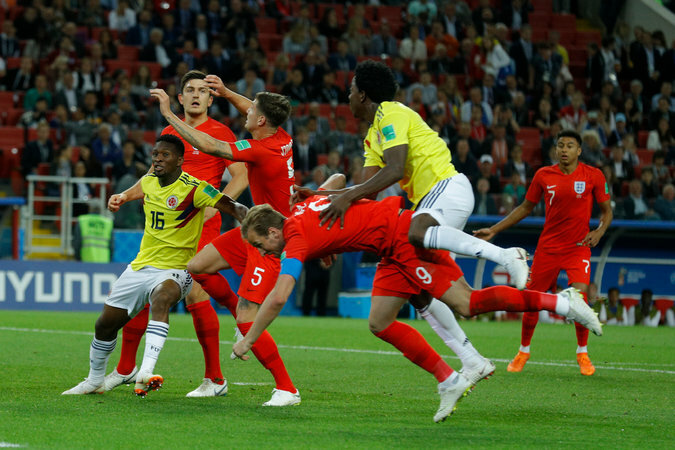 Rory Smith: It’s slightly curious that Colombia — still a gifted squad, even without James Rodriguez, the country’s talismanic playmaker — seem to have decided that the only route to victory (or, now, parity) is to turn the game into a tetchy, fractious scrap. This is a team capable of playing sweeping, attractive, counterattacking soccer, now focusing solely (it seems) on angering the England players. It’s not only not working, it’s proving counterproductive: it’s Colombia that seems on edge, indisciplined, picking up yellow cards in quick succession. Santiago Arias is given a yellow card for crashing into Harry Kane’s back on a header. The Fox broadcast reports there was a dustup in the tunnel as both teams emerged. In the first half England attempted eight shots to Colombia’s four, and put four of them on target to Colombia’s two. They also possessed more of the ball (55 percent), took four corner kicks to Colombia’s none and fouled half as many times. All of which is a pretty fair reflection of the game. England has had more of the ball closer to Colombia’s goal, and has squandered a number of set piece opportunities. 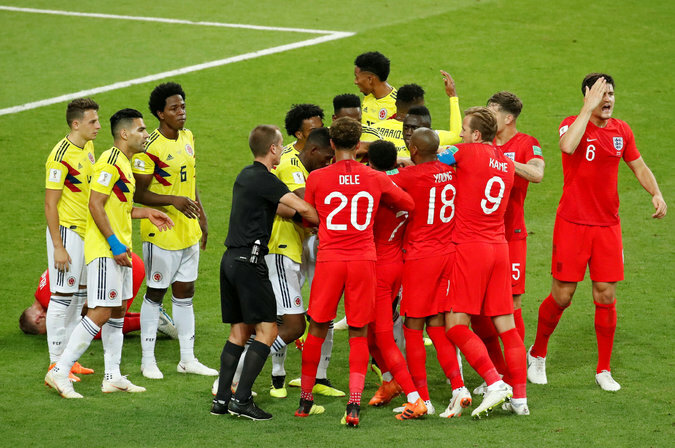 And while Colombia isn’t fouling at an egregious rate, they’re definitely doing so more, annoying the English players and leading to a couple of dust-ups. We’re given three more minutes. While the tempers have flared, the actual game has settled down a bit. Both teams are holding the ball and advancing near their opponent’s box, but neither are able to complete a killer pass or get a clean shot on goal. Colombia gets a shot attempt! Unfortunately, Juan Quintero’s scuffed shot from 25 yards out goes about that far away from the goal. Kieran Trippier’s corner kick looks dangerous, but Colombia pounces on it to end the threat. With James Rodriguez out, Colombia’s attack is running through Juventus (and former Chelsea) man Juan Cuadrado, with Radamel Falcao staying up high. Good, searching ball from Quintero there, trying to get Falcao behind the center backs. It sailed a bit, right to Pickford, but that’s a good message to be sending if you’re Colombia, and a good way to try to get Falcao into the game a little more than he’s been. The possession stats only favor England slightly, but almost the entire game is taking place in Colombia’s half of the field. Colombia has either made the conscious decision to concede possession to England, or they simply can’t control the ball for long stretches. While England has continually pelted their goal, Colombia hasn’t yet had a sustained attack. We are underway! Colombia kicks off in yellow, while England is rocking an all-red kit. Colombia won the pregame scene outside, the prematch warmups and now the anthems (in a rout). The harder job — winning a place in the quarterfinals — starts now. Enjoy. The big news in the Colombia lineup is no James Rodriguez. He won’t make an appearance. England manager Gareth Southgate names the expected lineup, sticking with three at the back and Raheem Sterling, Jesse Lingard and Dele Alli all supporting Harry Kane.